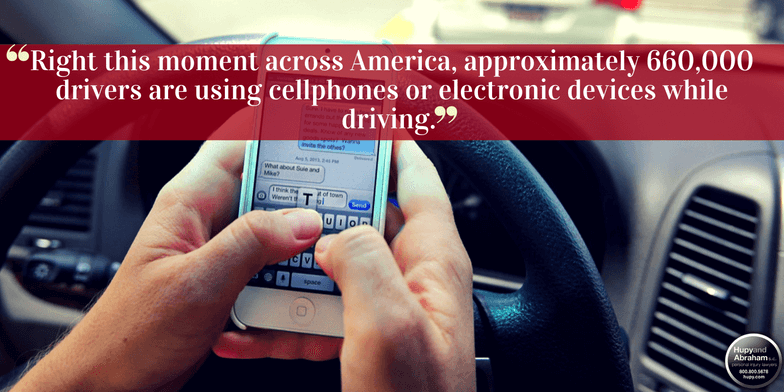 Hupy and Abraham Supports Distracted Driving Awareness Month | Hupy and Abraham, S.C. Right this moment across America, approximately 660,000 drivers are using cellphones or electronic devices while driving. This level of distraction will be the cause of over nine deaths today and 1,153 people injured in crashes involving a distracted driver. In an effort to deal with the unprecedented number of deaths associated with distracted driving, the National Department of Transportation and the National Safety Council have declared the month of April as National Distracted Driving Awareness Month. Remember that all forms of distractions endanger the safety of the driver, passengers and bystanders. While texting is a known culprit of distracted driving, over 80 percent of Americans report feeling that hands-free devices are safer than using their handheld phone. This is not the case. Since your brain is forced to focus its attention to the conversation, talking on the phone while driving is an example of a cognitive distraction. Hands-free features in dashboards actually increase mental distraction, and voice-to-text features are often more distracting then actually typing a text. With these tips we know that you’ll be more likely to arrive safely at your destination. Distracted driving is a choice, and we must choose not to let our devices control our actions. To help spread awareness, get your free "DNT TXT N DRV" bumper sticker from Hupy and Abraham here. We hope that you don’t have to contact us. But in the unfortunate event that you or a loved one are injured by a distracted driver, please contact Hupy and Abraham at 1-800-800-5678 to receive the compensation you’re entitled to.